I know, I know...ANOTHER bird shot...seems to be a lot this month. On my morning commute into the city from Butler I spotted this bird moving from the brush to the left of the road. I stopped right there, making two trucks stop as well, pointed my camera out the window and got this shot. It was cold, crisp and sunny with a layer of frost that I think adds to the photo. 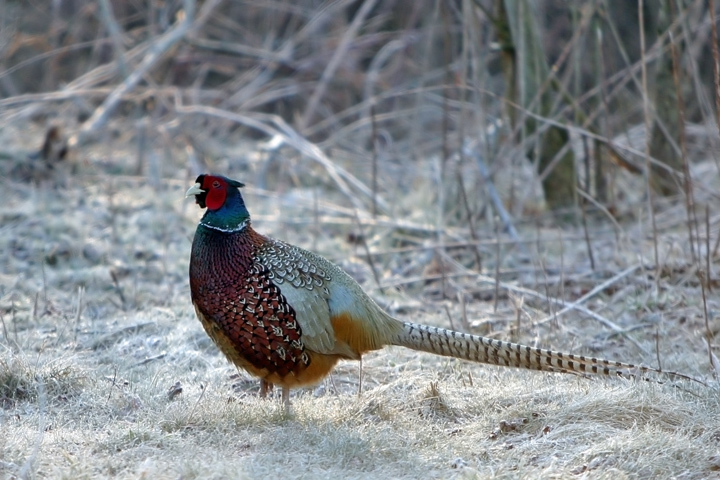 This is a Ring-Necked Pheasant, Phasianus colchicus , an introduced bird from China. Usually, I only see very scrawny birds that are raised on game farms and released for hunting. This one is nice and robust. Color contrast of the pheasant and the background is striking. Looks like it could be a nature painting. The frost makes the colors of the bird stand out. A stunning shot. Drive carefully. WOW the thumb does not do this justice! Great shot Ron!! Nice. The bird stands out well and the frost does add, by being a very neutral color and giving us a sense of cold. wow , lovely shot , great colours . This is a great capture Ron. The colors just jump out. Wow, what a great shot of an elusive bird! Wow, this is so beautiful, the bird and the background! Think you got it so sharp and nice, real good work! What a beautiful bird and beautiful photo.... but be careful, I don't wanna see a picture of your smushed vehicle, ya' hear!? So nice of him to posse so perfectly for you . . and I need to cover my ears cuz I can HEAR all the bad language that was hailing in your direction from those two trukers!! LOL!